Well, as we all know, the Formula 1 season has been going quite a while, what with the Korean race taking place yesterday, however, the game has only been out for around a month now. This has given me quite some time to play it and get good for that matter. So here’s what I thought of the game. First off, the graphics are impeccable. For some reason, in today’s industry, everyone is looking for great graphics in a game, i’m not sure why, but that’s what is happening. F1 2010 does not fail to impress! Whether you use the view above the helmet, the view from behind the car, or the first person view the car and environments look fantastic. On top of this, as you reach speed, it looks even better. Another really good aspect of the game is the gradual change in track condition when it rains, and, when using first person or above helmets views, the rain splatters on the screen look really good. Now, with the questionable section dealt with, I can talk about the fun. The game features 4 main game modes: Career, Grand Prix, Time Trial and Multiplayer. Career mode is pretty standard and sees you play through a 3, 5 or 7 year career as yourself. In this you initially race for one of the lesser teams as you are a new driver, and as your career progresses, you get invited to better teams. On top of this, your drivers rank increases, which unlocks newer rivals and stuff. In career, you can choose to take part in either a long weekend, which consists of 1 practice, 3 qualifying sessions and the main race, or a short weekend which is just 1 practice, 1 qualifying and the race. And you also get to choose how much of the race you wanna do. 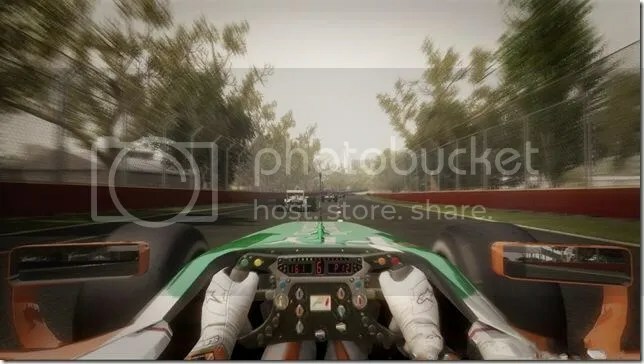 Grand Prix mode is just a single race mode where you can race as any of the pre-existing drivers and cars on any of the tracks. Time trial is exactly what it says it is, and you can have multiplayer party time trial mode, where you can all take it in turns to set lap times. This can get competitive but isn’t quite as fun as split screen as it is turn based. The final mode is somewhat a disappointment, but at the same time, awesome! To be able to play split screen with a friend would have been such an awesome addition to the game, and i can’t figure out why it wasn’t included! Not everyone can play online, and not everyone i know has the game! But, being able to race anyone around the world is a pretty sick idea, especially as you don’t lose any of the screen size, graphics or sound. I know, you can do that with pretty much every racing game, but being able to race in F1 cars just feels special to me. The driving in the game is fast paced and technical. From what i can imagine, they have got it pretty close to the actual sport, which is pretty impressive. The wear on the tyres is pretty realistic too, both visually and in terms of driving. The longer you use a set of tyres, the balder they get. This gives you less grip and you can really feel it round the corners and even in your speed and acceleration if you have a set on long enough. Losing heat in your tyres and brakes also affects your ability to drive. When your breaks are cold, it takes longer to stop. When your tyres are cold, it’s harder to turn. Simple. Again, a massive feature of this game is it’s dynamic weather system. Not many, if any, of the current generation of racing games have this kind of power when it comes to weather systems. A prime example of this is in Forza 3. Sure it was fantastic in terms of car physics, but it was always sunny. In F1, the weather can change at any time, and is more likely to depending on location. And when the weather turns, it can turn a little, or heavily. Both affect your driving in different ways, and can completely change the pace of a race. Overall, F1 2010 is a well rounded game, but it’s not quite perfect. The mulitplayer was a real let down, especially with the lack of split screen. The driving physics are brilliant and the graphics are pretty swell too. I’d give it a pretty solid 7.3/10.